This comes down to 85.67 cent per brick. The Cargo Train (10875) Lego set is available from the sites below. However, they do not offer delivery to your selected region. The Cargo Train (10875) Lego set is no longer directly available from the sites below. However, 3rd party partners of these sites might still have the set available. Alternate description Just push the LEGO® DUPLO® Cargo Train to send it to the harbor! 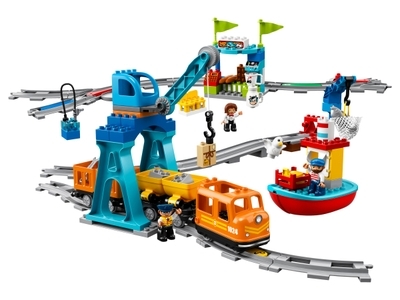 Includes cargo train driver, captain, and shopkeeper LEGO® DUPLO® figures, plus a seagull figure. Features a buildable Push & Go locomotive with lights and sounds, 2 cargo trucks with tipping function, 5 color-coded action bricks, harbor area with small crane and boat, large crane, café, loading/unloading station and 24 pieces of track including switches, hills, a crossing and stops. Accessory elements include a gas pump, coffee machine, cup, chocolate bar, milk bottle, fishing net, bread, bananas, parcel, cash register, wrench, fish and a menu. Any toddler can start the train with a gentle push forwards or backwards, and stop it by placing their hand firmly on top of the engine. Show your child how to place the 5 colored action bricks and move them around the track to make the train sound the horn, turn on the lights, refuel, change direction or stop. Help your child load and unload the tipping cargo containers using the moving crane. Push the train to send it towards the harbor and collect the fish from the boat. Enjoy shop role-play with your child as the train driver stops for lunch at the café. Extend the play possibilities by downloading the free app with remote-control function and fun activities for young children to complete. Try floating the little boat in the bath! Combine with the 10872 Train Bridge and Tracks, 10874 Steam Train and [setlink:10882}10882 Train Tracks for even more track combinations and LEGO® DUPLO® train fun. Cargo Train with cargo trucks measures over 3” (10cm) high, 18” (47cm) long and 3” (8cm) wide. Station measures over 7” (18cm) high, 5” (15cm) wide and 5” (13cm) deep. Large crane measures over 13” (35cm) high, 6” (16cm) wide and 6” (16cm) deep. Boat measures over 6” (17cm) high, 7” (19cm) long and 5” (13cm) wide.